They have fought in Germany, Canada, Denmark and the U.S.A. but the Super Middleweight brothers have never fought in the country they were born in, Mexico. All that will change on August 27th as they will be headlining a card in their home state of Guanajuato. The fight will take place in the city of Leon and be broadcast on Televisa in Mexico and AT&T U-verse will broadcast the card on the internet. Andrade (29-4,22 KO's) will face Matt O'Brien (18-2,7 KO's) in a 10 round Super Middle attraction. 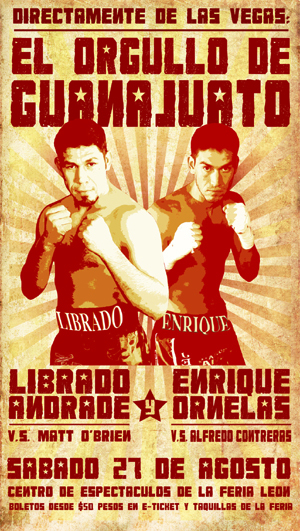 Ornelas (31-7,20 KO's) faces Alfredo Contreras (11-11-2,5 KO's) in a 10 round Lt. Heavy scrap. Andrade told Pound4Pound, "Both my brother and I are very excited to be fighting in our home for the first time in our careers. We promise the fans in Mexico that we are preparing well and will put on a great show for everyone who comes out to see us. We want to thank Golden Boy's David Iskowitz for his hard work in getting us this fight, it means so much to us that he is helping us to have our dream of fighting in our home come true."